Miracles on Minnesota Ave! – Dairy Queen Corp.
DQ Grill & Chill on Minnesota Ave. in Sioux Falls wants to add some joy to your Mondays! Each month, from 2-4 pm, you can stop in and get a miracle child’s favorite treat, and they’ll donate a portion of the proceeds to Children’s Miracle Network at Sanford Children’s Hospital! How sweet is that?!? This month, Jaxon is the Miracle of the Month. His favorite treat? A cookie dough Blizzard. Jaxon suffers from a rare genetic disorder…so rare that he and his brother are the only two known patients. They call it Scheff Boy syndrome. They are missing three genes on the X chromosome—it effects their vision with ocular albinism and their breathing with pyriform aperture stenosis. Beyond that, doctors don’t know what else is on those missing genes. There could be more complications that come along as the boys grow. Jaxon uses glasses to help him focus, but he still isn’t able to see well. The best way to describe his vision is that his eyes are the camera—they have all the parts, but they just don’t have the film. Because of this, Jaxon won’t be able to drive, and he can no longer play baseball. 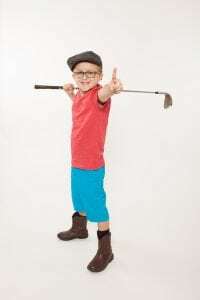 For the first few years, Jaxon was able to play baseball with his dad acting as his eyes, but now that the ball moves faster, Jax has to find new activities to enjoy. 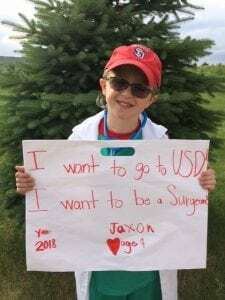 Jaxon loves playing flag football and is going to be quite the philanthropist someday—he and his brother have raised over $2000 for CMN this year!